This article is about the singer. For his self-titled album, see Luis Miguel (album). For other uses, see Luis Miguel (disambiguation). This name uses Spanish naming customs: the first or paternal family name is Gallego and the second or maternal family name is Basteri. Luis Miguel Gallego Basteri (born 19 April 1970) is a Puerto Rican-born Mexican singer and icon in Latin America, often referred to as El Sol de México (The Sun of Mexico). He is widely regarded by many as the most successful artist in Latin American history, having successfully performed in a wide range of musical styles, including pop, ballads, boleros, tangos, jazz, big band and mariachi. Luis Miguel is also recognized as the only Latin singer of his generation to not crossover to the anglo market during the "Latin Explosion" in the 1990s. Despite singing only in Spanish, he continued to be the best selling Latin artist in the 1990s, and was credited for popularizing the bolero genre into the mainstream market. To date, he has sold over 100 million records worldwide. Latin pop music, along with his personal life and showmanship on stage, has made Luis Miguel popular for nearly his entire career, which started in Mexico in 1982. Having won his first Grammy Award at the age of fourteen for his duet "Me Gustas Tal Como Eres" with Sheena Easton, he is the youngest male artist in music history to have received this accolade. In 1991, the RIAA recognized the high sales for his 1991 album Romance, itself being the third best-selling music album in Mexico, and one of the best-selling Spanish language albums of all time. He was the first Latin artist to have been awarded two Platinum certified Spanish-language albums in the United States with ‘‘Romance’’ and ‘‘Segundo Romance’’ the latter earning him 35 platinum records throughout Central and South America. He is also recognized by Billboard, as the artist with the most top 10 hits on the Billboard's Hot Latin Songs chart. His album Complices was released in 2008 and peaked at No.10 on the Billboard 200; it is the highest position a fully Spanish composed album has reached. His most recent album ¡México Por Siempre! was released in 2017, and it earned him his second No. 1 on the Billboard Regional Mexican Albums and achieved double platinum status. Luis Miguel is also known for his high-grossing live performances. He is the first-highest grossing Latin touring artist ever since Boxscore began tracking touring data in 1990, with a towering total of $278.5 million. With the Luis Miguel Tour, which took place in 2010, he visited 22 countries in North America, South America and Europe, where he performed in a three-year span with a total of 223 shows all over the world, making it the longest and highest-grossing tour ever made by a Latin artist. He also holds the record for the most consecutive presentations in the Auditorio Nacional (National Auditorium) with a total of 30 consecutive concerts as well as the record for the most presentations in the same venue with a total of 258 concerts. During his child years, his father, who was also his manager, encouraged him to watch and analyze nearly every movie, recording, and concert performance of Elvis Presley. In 1982, Luis Miguel released his first album, Un Sol, by the Mexican branch of EMI Records, which won him his first gold disc at the age of 11. Two years later, he started touring Latin American countries including Colombia, Venezuela, Chile, and Argentina. He scored a major hit with his single, "1+1=Dos Enamorados". In 1984, Luis Miguel turned into Spanish rock-pop style, with the international release of his fourth studio album Palabra de Honor produced by the then Spanish Hispavox director Honorio Herrero. In 1985, at age of 15, he took part at the Sanremo Music Festival, where he won the second place award with his song "Noi Ragazzi Di Oggi". That same year, he was also presented with the "Antorcha de Plata" Award in the Viña del Mar Music Festival for his duet single "Me Gustas Tal Como Eres" ("I Like You Just As You Are") with Scottish singer Sheena Easton. In 1983, he co-starred in the film Ya Nunca Más (released 1984) and in 1985, Fiebre de Amor with singer Lucero as his co-star. In 1986, Luis Miguel gave his career a brief break, as his relationship with his father was souring due to alleged mismanagement, poor financial decisions and risking his earnings of his career. Shortly after signing with Warner Records, in 1987, he fired his father and started to work with Juan Carlos Calderón. Luis Miguel's album Soy Como Quiero Ser in May 1987 sold well over 2.5 million records. The album featured covering hits such as "Cuando Calienta El Sol", "Ahora Te Puedes Marchar", and "Yo Que No Vivo Sin Ti". On 25 November 1988, Luis Miguel's second album Busca Una Mujer was released. The first single La Incondicional became a top-ten hit throughout Latin America in the first half of 1989, thanks in part to the music video it spent over seven months on the top ten of many Latin American charts. The video was shocking to many fans as he had cut his signature long hair. This cemented his transition from a child star into an adult superstar. By the end of 1989, the second single Fría Como el Viento reached No. 1 on the Hot Latin Tracks. He also had a top-ten single Separados in early 1990, peaking at #8. In 1990, he made a successful transition from a child singer to an adult showman with the album 20 Años and an ensuing string of sold-out shows first in Mexico then throughout Latin America and elsewhere in the world. 20 Años which sold 600,000 copies in its first week of release, resulted in release of three singles "Tengo Todo Excepto A Ti" , "Entrégate" , "Amante Del Amor" with the two former hitting number 1 on Billboard's Hot Latin Tracks in 1990. In 1991, Luis Miguel's career went to even greater heights and earned him the respect of a wider audience with the release of Romance, an album of romantic boleros, most of them from the 1950s. He has been credited with reinventing the bolero for modern audiences. The album Romance, which became his most successful material ever, eventually sold 7 million units worldwide. In 1993, Luis Miguel's fifth studio album, Aries, was released, which won him that year's Grammy Award for Best Latin Pop Album. That same year Luis Miguel was personally invited by Frank Sinatra to join him on his Duets II album and to perform live in a nationally televised special in honor of Sinatra's 80th birthday; along with other stars such as Stevie Wonder and Natalie Cole. In 1994, he released a sequel to Romance, Segundo Romance, featuring Luis Miguel as a convincing pop singer with mastery over timeless Latin classics such as "Solamente Una Vez" and "Historia de un Amor". The album went on to earn another Grammy Award, as well as skyrocketing Platinum status in the United States. In 1996, for his contribution to the recording industry, Luis Miguel received a star and was inducted to the Hollywood Walk of Fame, being at that time the youngest male singer to receive a star. Soon after, Luis Miguel quickly returned to the studios and released Nada Es Igual, a pop album featuring "Sueña", the main theme for Disney's The Hunchback of Notre Dame. In 1997, Luis Miguel released his third album of the bolero series Romances, which sold over 5 million copies. "Por Debajo de la Mesa" was released as the lead single from the album. The single quickly reached number one on the Billboard Hot Latin Songs chart, two months later; it would spend twenty-six weeks on the chart. At the 40th Annual Grammy Awards in 1998, Luis Miguel won the award for Best Latin Pop Performance. He also received the Billboard Latin Music Award for "Male Pop Album of the Year" and the World Music Award for "Best Selling Latin Artist" in the same year. In 1999, Luis Miguel released his ninth studio album Amarte Es Un Placer which, in 2000, earned him two Latin Grammys for being Best Album of the Year and Best Pop Album of the Year. The single "O Tú, O Ninguna" of Amarte Es Un Placer became number 1 on the Billboard Hot Latin Tracks and perched at the top position for eight consecutive weeks. Following the success of Amarte Es Un Placer, Luis Miguel released Mis Romances in 2001, his fourth album in the bolero series. The album, which sold over two million copies worldwide was followed by the launch of Mis Romances Tour which took place throughout the U.S., Europe, and Latin America. In 2003, Luis Miguel released his first pop album in over four years entitled 33, indicative of his age. The album, which featured a collection of ballads and uptempo songs climbed to number 1 on Billboard's Latin Charts earning Luis Miguel two Billboard Awards as well as Grammy and Latin Grammy award nominations. On the 33 Tour, Luis Miguel filled the largest halls in the U.S., toured throughout Latin America, including Chile where his album 33 sold 2.5 million copies and was recognized that same year by Warner Chile as the artist with the most sold records sold in the history of Chile. He also performed at Mexico's sold-out National Auditorium, and various sold-out shows at Buenos Aires, as well as other prestigious international venues such as Plaza de Toros de Las Ventas in Spain. That same year, Prince Felipe of Spain presented him with a special award for being the best-selling foreign artist in his country's history, and hosted a special party in his honor in Madrid. 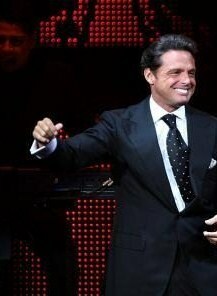 In addition to his album 33 Luis Miguel was bestowed by Lo Nuestro Awards in 2003 a "Premio Lo Nuestro a la Excelencia", (literally, The "Ours" award for Excellence) a lifetime achievement award for his outstanding career at the mere age of 33 being the youngest artist to receive this award. In 2004, Luis Miguel released his Mexico En La Piel. The album, which was a collection of traditional Mexican mariachi songs went on to sell five million copies worldwide. For this album he received a diamond disc and won the Latin Grammy Award for Best Ranchero Album at the Latin Grammy Awards of 2005 and also the Grammy Award for Best Mexican/Mexican-American Album. He launched his Mexico En La Piel Tour in 2005. 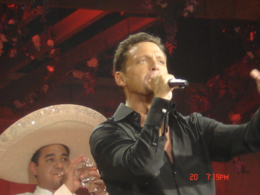 In 2006, Luis Miguel performed thirty shows between 18 January and 27 February at the National Auditorium in Mexico City. The 123-date tour started in September 2005 in Mexico which then stretched to Argentina, Chile and Uruguay. The Mexico En La Piel Tour won the Billboard "Tour of the Year" and positioned itself as No.1 on the Billboard World Top Boxscore. In 2005, Luis Miguel released Grandes éxitos, his first greatest hits album, that featured his greatest songs he recorded during all his career, including two never-released singles: "Misterios Del Amor" and "Si Te Perdiera". That same year, he released a Christmas album called Navidades. The playlist includes many Christmas standards in Spanish. The album reached number one on Billboard's Top Latin Albums chart during the first week of its release. The album released two singles "Santa Claus Llegó A La Ciudad" ("Santa Claus Is Coming to Town"), and "Mi Humilde Oración" ("My Grown-up Christmas List"). On 6 May 2008, Luis Miguel released Cómplices, produced by him and written by Spanish composer Manuel Alejandro. It sold almost 350,000 copies in the first 24 hours. The first single, "Si Tú Te Atreves" was released on 7 April 2008, the second single of the album was "Te Desean". Luis Miguel made history with his album Complices which debuted at No.10 on the Billboard Top 200, being the highest position a Latin artist has ever reached on the Billboard Top 200 with a fully Spanish composed album, it also reached No.1 on the Billboard Top Latin Albums making him the Latin artist with the most No.1 albums on the chart with a total of 9 albums. His Complices Tour began in Seattle, Washington on 3 September 2008. Luis Miguel released his self-titled studio album on 14 September 2010. Its first single "Labios de Miel" is a smooth Latin pop song. The tour started on 4 November 2010 in the city of Lima, Peru and covered the United States, South America, Mexico and Spain among other countries. On 22 February 2012, he sang at the Viña del Mar International Song Festival. With one million dollars for his performance, he became the most expensive artist in the history of the festival. Luis Miguel performed at the Curaçao North Sea Jazz Festival on 31 August 2013. On August 2014, the song "Déjà Vu" was leaked on the web. On 4 May 2017, Telemundo signed a deal for the exclusive U.S. broadcast rights to the "officially authorized TV series" based on Luis Miguel's life story and announced it will air in 2018. On the same day, Netflix also revealed it has the rights to stream the yet-unnamed bio-series in Latin America and Spain with the same target date. In his official Facebook page it was announced that his new single "La Fiesta del Mariachi" was set to release on 27 October 2017. On 24 November, the full album, titled ¡México Por Siempre! was released, it features 14 tracks of traditional Mexican music. The tour began on 21 February 2018, in the National Auditorium of Mexico City with 8 shows and will continue throughout Mexico, United States and Spain. Luis Miguel continues to keep his personal life private. His father was a Spanish singer, songwriter and guitarist, Luis Gallego Sanchez, known as "Luisito Rey", and his mother was an Italian actress, Marcela Basteri. His father was from Cádiz, a city in southwestern Spain, and his mother was from the Province of Massa-Carrara, Italy. He was named Luis Miguel in honor of Spanish bullfighter Luis Miguel Dominguín. Luis Miguel has two younger brothers, Alejandro and Sergio. His birth date is on 18 April, but he celebrates his birthday on 19 April as that was the day his father registered him on Puerto Rico's Civil Registry. Due to his early fame, Luis Miguel had a complicated childhood. He had a difficult relationship with his father, who was also his manager. His father was very strict and demanding during the incessant rehearsals, although his father's strict discipline has also been credited with playing a large role in his success. In 1986, Luis Miguel's mother disappeared mysteriously and her whereabouts are still unknown. In the late 1980s, Luis Miguel fired his father due to financial problems caused by poor representation. After their estrangement, his father, who was a heavy drinker, fell into depression and died on 9 December 1992 in Spain. Luis Miguel is recognized for his taste for haute cuisine and for being a self-taught sommelier. Luis Miguel released his own vintage of wine, "Único. Luis Miguel", a Cabernet Sauvignon. A native Spanish speaker, he also speaks fluent English, Italian and Portuguese. Luis Miguel is the father of three children: Michelle Gallego, born on 13 June 1989, from his relationship with Stephanie Salas; Miguel, born on 1 January 2007 and Daniel, born on 18 December 2008, both from his relationship with actress Aracely Arámbula. His numerous relationships are widely covered by the Latin media. Regarding his religious faith, he stated: "I am Catholic because I was born in a Catholic family. I believe in God, I visit church whenever I rarely have the chance due to my work commitments." In April 2010, he was briefly hospitalized at the Cedars-Sinai Medical Center in Los Angeles. The cause of the hospitalization was not disclosed. On 2 May 2017, Luis Miguel surrendered himself to the U.S. Marshals following a case with his former manager William Brockhaus where Luis Miguel was ordered to pay him over one million dollars on July 2016. He was released that same day by signing a promissory note. Luis Miguel rarely grants interviews or attends award ceremonies. He is always escorted by a diligent security team and he is transported in several trucks to distract paparazzi and reporters. Luis Miguel is known for being a hermetic and mysterious individual. He is quoted as saying, "I maintain my sanity by keeping my distance." Luis Miguel is considered as one of the top male pop singers worldwide today. His voice has been estimated to span three octaves, six notes. In a career that has spanned over twenty-five years, he has become the main male singer from Latin America, having performed successfully pop music, bolero, mariachi and romantic ballads. In the late 1980s, Luis Miguel made the transition from child star to consolidated international singer, and since then, he became one of the most revered and popular Latin American artists ever. Also dubbed as a crooner, his wide vocal range and performance has been praised by critics and other artists all over the world. Producer Gustavo Santaolalla described him as "one of the greatest singers of all time" and stated that "Luis Miguel is not just a singer, he's an artist." Frank Sinatra personally invited Luis Miguel to participate on a duet in the album Duets II. Luis Miguel has been dubbed several times by the press and the media as the "Latin Frank Sinatra". His music has reached speaking continents such as Asia and Africa. The press stated that at the time of his capture, the dictator Saddam Hussein had the album Segundo Romance, among his belongings. At the age of fourteen, Luis Miguel received a Grammy Award for his duet "Me Gustas Tal Como Eres" (I Like You Just The Way You Are) with Sheena Easton. In 1991, the RIAA gave him a recognition for the high sales of the albums Romance and Segundo Romance. Luis Miguel is the only Latin artist to have two Spanish-language albums (Romance and Segundo Romance) go platinum in the USA. He was the only Latin artist to perform at the show "Sinatra: 80 Years My Way", along with other pop icons such as Bruce Springsteen, Natalie Cole and Bob Dylan. His album Romances of 1997, became the first Spanish-language album ever debuting at No. 14 on the Billboard Top 200. Warner Music Group recognized Luis Miguel as the best-selling artist in the history of Chile with over 2.5 million records sold. In 2003, Prince Felipe of Spain presented him with a special award for being the best-selling foreign artist in his country's history. In 2008, Luis Miguel's album Navidades became the first Christmas album ever being nominated to the Grammy in the category of Pop. His album Cómplices broke records in Mexico, by selling over 320,000 copies in its first day of release. Just three days after its release, his new album achieved Quadruple Platinum certification in Mexico, Platinum in Argentina and gold records in Chile and the United States. Luis Miguel is also known by his high-grossing tours and Chile, Uruguay, Venezuela, Brazil and Spain between 1999 and 2000. The tour consisted of 105 concerts and was attended by approximately 1.5 million fans. It was the highest-grossing tour ever made by a Latin artist, as well as the most extended. These two records have been broken by his Mexico En La Piel Tour. His 33 Tour peaked at No. 1 in the Billboard World Top Boxscore. The Mexico En La Piel Tour of 2005–2007, with a total of 124 concerts, peaked at No. 1 in the Billboard World Top Boxscore. The tour spanned two years with a total of 124 concerts attended by over 1.5 millions spectators, and grossed around $95 million. In 2006, during the Mexico En La Piel Tour, after giving 30 consecutive sold-out concerts at the Auditorio Nacional in Mexico, gathering over 260,000 spectators he was awarded with the "Estela de Plata" at the last concert. His Luis Miguel Tour is ranked at number five of the highest-grossing tours of 2011 in North America. In 1984, received the Grammy Award for Best Mexican American Performance for his duet "Me Gustas Tal Como Eres" (I Like You Just The Way You Are) with Sheena Easton. In 1985, Luis Miguel won Antorcha de Plata at the Festival de la Cancion de Viña del Mar for his duet "Me Gustas Tal Como Eres" (I Like You Just The Way You Are) with Sheena Easton. In 1985, wins the second place at the Sanremo Music Festival in Italy with the song "Noi Ragazzi di Oggi" (Lyrics by Cristiano Minellono - Music by Pino Donaggio). In 1990, won two more Antorcha de Plata at the Festival de la Cancion de Viña del Mar. In 1991, Luis Miguel was recognized at South Korea International Music Award as the best abroad for his album "Romance" for Romance. In 1991, received recognition by RIAA for selling 2 millions copies of Romance and Segundo Romance. In 1992, he received European Excellence prize in Spain. In 1992, received a Billboard Awards for the Best Latin Artist, for the Best Spanish-language Album (for his album Romance) and Best Singer in Spanish. In 1993, received a Billboard Awards for Best Latin Male Artist of the Year, Best Spanish-Language Album of the Year Aries. In 1993, received a Grammy Award for the Best Latin Pop Album Aries. In 1994, received a Grammy Award for being the Best Latin Male singer with his album Segundo Romance. In 1994, he was invited to record a special-edition duet of "Come Fly With Me" with Frank Sinatra for his album Duets II. In 1995, became the single Latin artist to perform at the show SINATRA: 80 Years My Way along with other pop icons such as Bruce Springsteen, Natalie Cole and Bob Dylan. In 1996, received a star in the Hollywood Walk of Fame. In 1996, he recorded the song "Sueña" (Spanish version of "Someday") for the Disney movie The Hunchback of Notre Dame. In 1997, Pollstar Magazine recognized Luis Miguel as the first Latin artist to enter the list of All-Time Top-20 grossing artists who have sold as many records in a single location in the history of music. In 1997, the album Romances became the first Spanish-language album ever debuting on the Billboard Top 200. In 1997, Luis Miguel received a Grammy Award for being the Best Latin Pop Artist of the Year with his album Romances. In 2000, received a Latin Grammy Award for Best Album of the Year and Best Pop Album of the Year on his Amarte es un Placer. In 2001, he received a Billboard Award for Best Male Pop Vocal Performance which included a collaboration with Michael Jackson in the Spanish version of "What More Can I Give" entitled "Todo Para Ti" dedicated to the victims of 11 September 2001 attacks in New York. In 2002 received the Premio Luna de Mexico (Moon of Mexico Award) for being the artist with the best artistic career (at that time of 20 years). In 2003, Warner Music recognized him as the best-selling artist in the history of Chile with over 2.5 million records sold. The 33 Tour peaked at No. 1 in the Billboard World Top Boxscore. In 2005, received a Latin Grammy Award for Best Ranchero Album México En La Piel. In 2005, received a Grammy Awards for Best Mexican Album Mexico En La Piel. 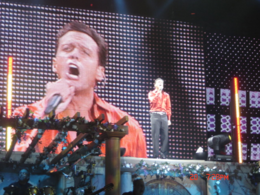 In 2005, followed by the En La Piel Tour in Mexico, Luis Miguel gave 6 consecutive sold-out concerts in the Gibson Universal Amphitheater in Los Angeles, CA. The Mexico En La Piel Tour peak No. 1 in the Billboard World Top Boxscore. 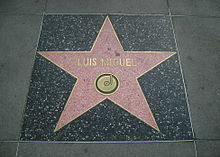 In 2005, Luis Miguel became the first Latin artist to receive a star on the streets of Las Vegas Star. In 2006, he won Estela de Plata for his tour in Mexico for giving 30 concerts at Auditorio Nacional, which, all in all gathered around 300,000 spectators. In 2008, Luis Miguel's album Navidades became the first Christmas album ever being nominated in the Grammy in the category of Pop. In 2008, the online store amazon.com announced that the album Complices had peaked number 1 in the list best-selling albums in the website two weeks before the release of the album. Cómplices broke records in Mexico, by selling over 320,000 copies in its first day of release. Cómplices debuts at # 1 on the Top Latin Albums tally Billboard Luis Miguel turning the artist with the most albums in this position in the history of the magazine. Cómplices debuts at # 10 in the "Top 200" magazine Billboard, the highest position it has achieved in his career in the American Union. Cómplices to three weeks of release obtained in Diamond disc by overcoming Mexico 400,000 copies sold. Dalia Silver 180 Concert Auditorio Nacional. Album "No Culpes a la Noche" # 180 in the Billboard Top 200. Labios de Miel # 1 in Mexico with Quadruple Platinum Album. ARTIST Named # 1 in more accumulated in the charts hits "Hot Latin Songs" Billboard Magazine issue 25 Years of Billboard "Hot Latin Songs"
In 22 February 2012 at the "International Song Festival of Viña del Mar" is rewarded with 3 "Gulls" (gold, silver, platinum) and the keys to the city. On 2 September 2012 in the "People in Spanish Festival" is awarded with "Lifetime Achievement Award" and "Mayor for a Day" in the city of San Antonio, Texas. Receive on 22 October 2012 in Argentina at the hands of President Cristina Kirschner a plaque in recognition of his 100 presentations in that country (1982-2012). In October 2012 he was named "distinguished guest" by the city of Antofagasta. On 13 September 2013 in Las Vegas is awarded with "Diamond Award", a certificate from the Nevada Governor's Office for their contributions to the state, a certificate from the United States Senate recognizing him as one of the top Hispanic artists in the world, and "Day of Luis Miguel". 1983: Ya nunca más (soundtrack to the film). 1985: Fiebre De Amor (soundtrack to the film). Navidades: 1 Diamond Discs, 10 Platinum Discs, 2 Gold Disc. The Grammy Awards are awarded annually by the National Academy of Recording Arts and Sciences of the United States. Miguel received six awards from fifteen nominations. ^ "Consulta CURP" (in Spanish). Archived from the original on 3 December 2013. ^ "Luis Miguel: Biography". Rovi Corporation. Retrieved 15 June 2012. ^ a b c d e f g h i j k l m n o p q r s t u v w x y z aa ab ac ad ae af ag ah ai aj ak al am an ao ap aq ar as at au av aw ax "LUIS MIGUEL: Complices_WARNER MUSIC" (in Spanish). gaymagazine.cl. 6 May 2008. Archived from the original on 12 May 2008. Retrieved 27 September 2011. ^ "Buzz Briefs: Luis Miguel, Bon Jovi". CBS News. 8 July 2008. ^ LOPETEGUI, ENRIQUE (20 September 1995). "One World Will Do, for Now : Pop music: 'My language and my world is Spanish,' says Luis Miguel, when asked about his crossover aspirations". Los Angeles Times. ISSN 0458-3035. Retrieved 10 June 2018. ^ HILBURN, ROBERT (20 September 1997). "Luis Miguel's Crossroad". Los Angeles Times. ISSN 0458-3035. Retrieved 10 June 2018. ^ "Biography for Luis Miguel". IMDb. Retrieved 13 December 2015. ^ "Luis Miguel to Perform in Puerto Vallarta November 15 Lorena Sonrisas - BanderasNews.com". Banderas News. 2015. Retrieved 13 December 2015. ^ "Luis Miguel First-Highest Grossing Latin Touring Artist". Billboard. 20 November 2018. ^ 30 concerts, Historic record 2006 National Auditorium! ^ a b c d e f g h i j k "Biography: Luis Miguel on elixic.de" (in German). elixic.de. ^ "Luis Miguel: Grandes Éxitos". Apple Music. ^ Martinez, Ricardo (11 November 2013). "Este hombre inventó la música para encerar… y nadie lo sabe (Parte I)" (in Spanish). terceracultura.cl/. Retrieved 24 October 2016. ^ a b c "Artist Chart History: Luis Miguel". Billboard Magazine. ^ "Luis Miguel en Altos de Chavón, y en el Sur profundo, una sonrisa para los turistas" [Luis Miguel in Altos de Chavon, and in the Deep South , a smile for tourists]. Diario Libre. 2 November 2013. Retrieved 21 September 2014. ^ Vergara, Claudia (21 February 2012). "Los mentores de Luis Miguel revelan sus mitos y obsesiones" [Luis Miguel's mentors reveal his myths and obsessions]. La Tercera (in Spanish). Copesa. Retrieved 15 July 2014. ^ "Biography: Luis Miguel on German Warner Music" (in German). Warner Music Germany. Archived from the original on 26 November 2008. ^ "Artist Chart History: Luis Miguel (Albums)". Billboard Magazine. ^ "Luis Miguel". University of Texas at Austin Performing Arts Center. Archived from the original on 27 February 2009. ^ Luis Miguel Sitio Oficial. Luismigueloficial.com. Retrieved on 13 August 2011. ^ "El nuevo episodio de la serie de Luis Miguel nos dejó a todos con ganas de comer 'Saboritas'". Buzzfeed (in Spanish). 29 April 2018. Retrieved 30 April 2018. ^ "LuisMiguel". Quien.com. Archived from the original on 25 January 2012. ^ Quien. Revista Quien. 19 April 2010. p. 18. ^ Luis Miguel website. Luismiguelsite.com (18 October 2005). Retrieved on 13 August 2011. ^ www.wine.com. http://www.wine.com. Retrieved on 13 August 2011. ^ LUIS MIGUEL NO BRASIL PROGRAMA DO FAUSTÃO 1999 [HQ].mp4. YouTube (15 March 2010). Retrieved on 13 August 2011. ^ LUIS MIGUEL – il cielo. YouTube (3 May 2008). Retrieved on 13 August 2011. ^ Nacé el tercer hijo de Luis Miguel. Eluniversal.com.mx. Retrieved on 13 August 2011. ^ "A Luis Miguel por el momento no le interesa el mercado anglosajón". El Siglo de Torreón (in Spanish). Editora de la Laguna. 2 August 1999. p. 37. Retrieved 20 October 2015. Soy católico, porque nací en el seno de una familia católica. Creo en Dios, cada vez que tengo oportunidad visito a la iglesia, rara vez; debido a mis compromisos de trabajo. ^ Hospitalization of Luis Miguel. Extratv.warnerbros.com (16 April 2010). Retrieved on 13 August 2011. ^ "Luis Miguel Surrenders to Authorities on Arrest Warrant". Billboard. 2 May 2017. Retrieved 2 May 2017. ^ TMZ website. Tmz.com (2007-06-14). Retrieved on 13 August 2011. ^ . brainyquote.com. Retrieved on 10 November 2013. ^ "Digging Deeper: Axl Rose is NOT the Singer With the Widest Range". ^ a b c Hilburn, Robert (20 September 1997). "Luis Miguel's Crossroad". Los Angeles Times. ^ a b c Gurza, Agustin (31 January 2002). "Crooner in Cruise Control". Los Angeles Times. ^ "Gustavo Santaolalla: "Luis Miguel no es un cantante, es un artista"". peopleenespanol.com. Retrieved 31 January 2016. ^ Luis Miguel es el preferido de Saddam Hussein. Terra. Retrieved on 13 August 2011. ^ 071811top100.pmd. (PDF) . Retrieved on 13 August 2011. ^ "RIAA: Searchable Database". Recording Industry Association of America. Recording Industry Association of America. Retrieved 9 December 2011. ^ "Spanish Certifications". Productores de Música de España (in Spanish). Productores de Música de España. Retrieved 9 December 2011. ^ "ABPD: Certificados". Associação Brasileira dos Produtores de Discos (in Portuguese). Associação Brasileira dos Produtores de Discos. Archived from the original on 6 September 2010. Retrieved 9 December 2011. ^ "AMPROFON: Certificaciones". AMPROFON. AMPROFON. Retrieved 9 December 2011. ^ "CAPIF: Discos de Oro y Platino". CAPIF. CAPIF. Archived from the original on 6 July 2011. Retrieved 9 December 2011. ^ "Luis Miguel y su disco Cómplices vende 320 mil copias" Archived 14 May 2008 at the Wayback Machine. Tvyespectaculos.com (6 May 2008). Retrieved on 13 August 2011.